Drone Above the Erie in Lyons! Henny Penny and Ducky Lucky would have really been confused and startled on Monday, July 6, had they been in Lyons near the Erie canal- a drone, hovering in the sky, was monitoring and filming boating activity in Lock E 27! The drone was operated by professional photographer Mark Goho of Business Photos America, a trusted agency for Google Maps Business View. 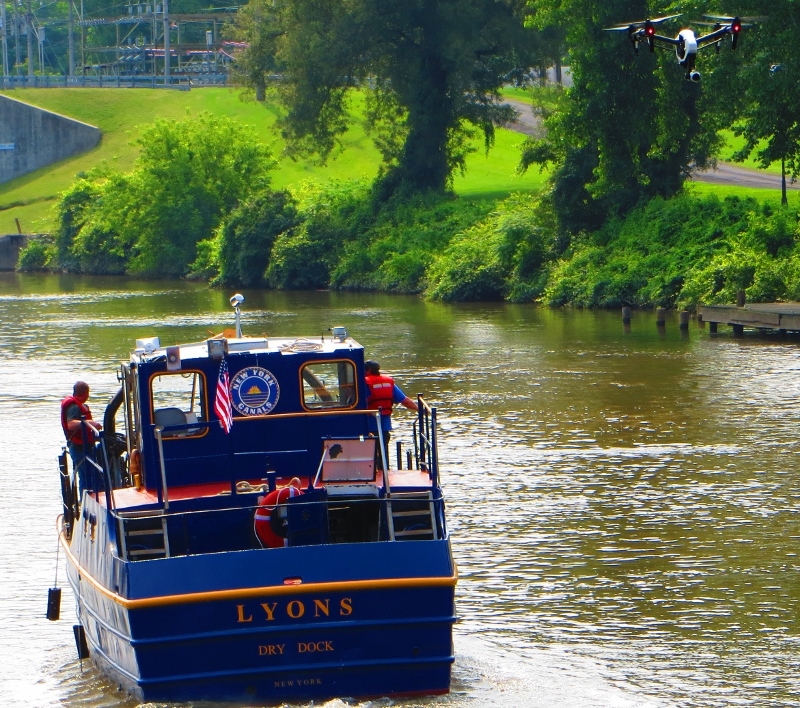 The filming activity was a pilot project to help promote the NYS Erie Canal and Historic Lock E 27 in Lyons. (Lock E 27 officially opened to commercial traffic on May 15, 1918)! 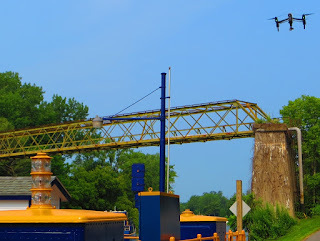 In the near future, once the filming has been edited and posted to Google Business Views, the public from around the world will be able to visit the Erie Canal in Lyons and conduct an interactive “Lock Through Tour” of Lock E 27 –with the aid of a cursor, they will enter, move up or down with the water flow, observe the 100 year old walls, and zoom in on the massive white oak mitre gates as they clank shut or swish open among the swirling waters. NYS Canal Corporation boat participants were the Tug Syracuse, operated by Captain Wendy Marble, and a recently renovated buoy boat, “Lyons” operated by Captain Kelly Key. Other participants included boating tourists Ron and Cindy Wilson from Little Valley, NY aboard Elyssa Marie and World Renowned and Internationally Acclaimed Saxophonist Mike and Ronelle Faure from Chicago. 0 Comments to "Drone Above the Erie in Lyons!"